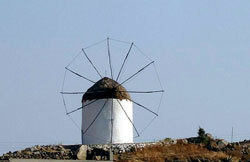 This is an exceptional route which offers a panoramic view of the south western shores of Naxos. From Hora we take the road to the Livadi plain and then the turn to Pirgaki. This road leads to the village of Glinado (6 km from Hora) with its beautiful island style old houses, a market, taverns and developed stockraising. In the middle of the plain, between Glinado and the sea, in Iria, are the remains of the sanctuary of the god Dionysus. The temple at Iria (580 - 550 BC) together with the sanctuary at Giroula, are architecturally considered for runners of the Parthenon. The sanctuary was used continuously until the Roman period. Restoration work on the monument has been completed and the area is open to the public. The next village that we come to is Agios Arsenios (7 km from Hora) with its beautiful whitewashed houses and well cared for courtyards, bursting with flowers. Tripodes (12 km from Hora) is the last village that we visit on the way to the sea; there you can find deserted windmills and a small folk museum. By the country road which connects the village with the beach of Plaka, are the remains of the old Plaka tower (an ancient Greek tower). Moving on in a southerly direction there is a turn to the right, which leads to the fine, white sand beaches of Kastraki (15 km from Hora) and Mikri Vigla (16 km from Hora). From the rock of Mikri Vigla (vigla means a guardhouse or a watch tower) which separates the beaches of Mikri Vigla and Parthenos, guards used to watch the sea for any sign of marauding pirates. Nowadays, from this same point, lots of windsurfers can be seen criss-crossing the waves. This area, due to the ideal weather conditions, has been chosen as a meeting place for windsurfing fans from all over the world. There are a few taverns and near the island of Parthenos, on the sea floor, are the remains of a settlement covered by the sea. We return to the main road and continue in a southerly direction. On our left hand side is the Oskelou tower (17th century). 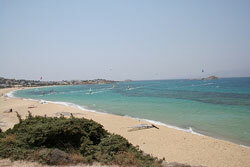 The next beach we come to is Alyko, with its sand dunes and clusters of cedar trees. 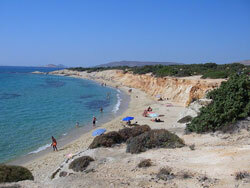 The road ends at Pirgaki (21 km from Hora), yet another wonderful sandy beach. Just before we reach Pirgaki we come to a turn to the left, leading to the beach at Agiassos. The land­scape is wonderful but the country road is in a poor state.